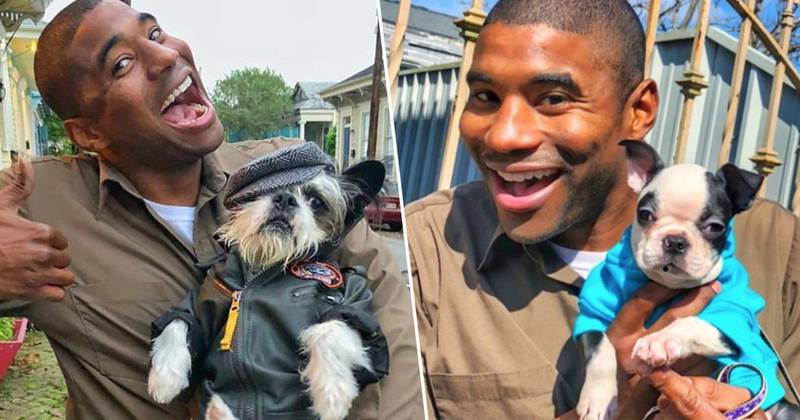 This UPS guy is here to deliver your daily dose of doggy cuteness. Jason Hardesty is a UPS driver based out of New Orleans, Louisiana, with a particularly cute work hobby. Whenever he meets cute puppers on his rounds, he takes a little photograph with them and posts the evidence to Instagram with the hashtag, ‘Pups of Jay’. Hardesty was inspired to start the literal pet projects when he got a new route at work. On his old route, he said, the delivery man encountered some not-so friendly guard dogs. So, when he got a new route where the dogs were a little less protective of their turf, he decided to honour the canine companions accordingly. My old route that I was on, the dogs in that area weren’t really too friendly. They would always want to be guard dogs, or aggressive dogs because it was more of a family area. But when they moved me to a certain part of town which has not as many families, the dogs are a lot nicer. I realized they would let you pick them up and pet them. So I guess maybe a few years ago I started throwing up a dog on it every week. Just a cute pup. He’s become quite the local neighbourhood staple, and the humans love how Jay interacts with their pets. There are two dogs. One of them really loved me and the other was really shy. But when they moved away, the second one finally let me play with her and pet her, like two days before they moved. That was really cool. Even though he meets a lot of Very Good Boys and Girls, Hardesty limits himself to one post a week. I don’t want my account to be known as a dog account, but I’ll still find a cute dog and post it that week. I don’t have the time to take care of a dog. That’s why I play with other people’s when I can. Don’t we all, Jay, don’t we all. Hardesty said he likes to post around 6pm on a Friday evening, when everyone is getting out of work, because he thinks is a nice way to end the week.